The clan Anrias or Ross - called in Gaelic clan Roisch na Gille Andras, or the offspring of the follower of St Andrew - by which can be meant only the chiefs or gentry of the clan, are descended from the Earls of Ross, and through them from the ancient Maormors of Ross. According to Mr Smibert, the mass of the clan Ross was swallowed up by and adopted the name of the more powerful Mackenzies. "The generality", he says, "had never at any time borne the name of Ross, the gentry of the sept only were so distinguished. 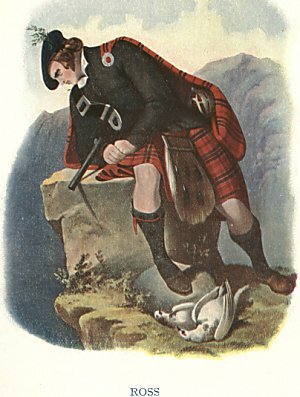 Thus, the common people, who must naturally have intermingled freely with the real Mackenzies, would ere long retain only vague traditions of their own descent; and when the days of regular registration, and also of military enlistment, required and introduced the use of stated names, the great body of the true Ross tribe would, without doubt, be enrolled under the name of Mackenzie, the prevailing one of the district. In all likelihood, therefore, the old Rosses are yet numerous in Ross-shire". The first know Earl of Ross was Malcolm, who lived in the reign of Malcolm the Maiden (1153-1165). Ferquhard, the second earl, called Fearchar Mac an t-Sagairt, or son of the priest, at the head of the tribes of Moray, repulsed Donald MacWilliam, the son of Donald Bane, when, soon after the accession of Alexander II in 1214, that restless chief made an inroad from Ireland into that province. William, third Earl of Ross, was one of the Scots nobles who entered into an agreement, 8th March 1258, with Llewellyn, Price of Wales, that the Scots and Welsh should only make peace with England by mutual consent. William, fourth earl, was one of the witnesses to the treaty of Bruce with Haco, King of Norway, 28th October 1312. With his clan he was at the battle of Bannockburn, and he signed the memorable letter to the Pope in 1320, asserting the independence of Scotland. He had two sons, Hugh, his successor, and John, who with his wife Margaret, second daughter of Alexander Comyn, fourth Earl of Buchan, got the half of her father's lands in Scotland. He had also a daughter, Isabel, who became the wife of Edward Bruce, Earl of Carrick and King of Ireland, brother of Robert the Bruce, 1st June 1317. Hugh, the next Earl of Ross, fell, in 1333, at Halidonhill. Hugh's successor, William, left no male heir. His eldest daughter, Euphemia, married Sir Walter Lesley of Lesley, Aberdeenshire, and had a son, Alexander, Earl of Ross, and a daughter, Margaret. Earl Alexander married a daughter of the Regent Albany, and his only child, Euphemia, Countess of Ross, becoming a nun, she resigned the earldom to her uncle John, Earl of Buchan, Albany's second son. Her aunt Margaret had married Donald, second Lord of the Isles, and that potent chief assumed in here right the title of Earl of Ross, and took possession of the earldom. This led to the battle of Harlaw in 1411. On the death of the Earl of Buchan and Ross, at the battle of Verneuil in France in 1424, the earldom of Ross reverted to the crown. James I on his return from his long captivity in England, restored it to the heiress of line, the mother of Alexander, Lord of the Isles, who, in 1420, had succeeded his father, Donald, above mentioned. In 1429 he summoned together his vassals, both of Ross and the Isles, and at the head of 10,000 men wasted the crown lands in the vicinity of Inverness, and burned the town itself to the ground. At the head of some troops, which he had promptly collected, the king hastened, by forced marches, to Lochaber, and surprised the earl. The mere display of the royal banner won over the clan Chattan and clan Cameron from his support, and he himself, suddenly attacked and hotly pursued, was compelled to sue, but in vain, for peace. Driven to despair, he resolved to cast himself on the royal mercy, and on Easter Sunday, did so in am extraordinary manner. Alexander's son, John, the next Earl of Ross and Lord of the Isles, having joined the Earl of Douglas in his rebellion against James II sent, in 1455, to the western coast of Scotland an expedition of 5000 men, under the command of his near kinsman, Donald Balloch, Lord of Islay. With this force he desolated the whole coast from Innerkip to Bute, the Cumbrays, and the island of Arran, but from the prudent precautions taken by the king to repel the invaders, the loss was not very considerable. The Earl of Ross afterwards made his submission, and was received into the royal favour. On the accession of James III however, his rebellious disposition again showed itself. Edward IV of England having entered into a negotiation with him to detach him from his allegiance, on the 19th October 1461, the Earl of Ross, Donald Balloch, and his son, John of Islay, held a council of their vassals and dependants at Astornish, at which it was agreed to send ambassadors to England to treat with Edward, for assistance to effect the entire conquest of Scotland. On the forfeiture of the Lord of the Isles in 1476, the earldom of Ross became vested in the crown. Hugh Ross of Rarichies, brother of the last Earl of Ross, obtained a charter of the lands of Balnagowan in 1374, and on him by clan law the chiefship devolved. In the beginning of the 18th century, Donald Ross of Balnagowan, the last of his race, sold that estate to the Hon. General Ross, the brother of the twelfth Lord Ross of Hawkhead, who, although bearing the same surname, was not in any way related to him. In February 1778, Munro Ross of Pitcalnie presented a petition to the king, claiming the earldom of Ross, as male descendant of the above-named Hugh Ross of Rarichies. This petition was sent to the House of Lords, but no decision appears to have followed upon it. According to Mr Skene, Ross of Pitcalnie is the representative of the ancient earls; but as this claim has been disputed, and as other authorities think the Balnagowan family has a stronger claim to the chiefship, we shall take the liberty of quoting what Mr Smibert says on behalf of the latter: - "Mr Skese labours, with a pertinacity to us almost incomprehensible, to destroy the pretensions of the house, to represent the old Earls of Ross. He attempts to make out, firstly, that Paul Mactyre (or Mactire), who headed for a time the clan Ross, was the true male-heir of the fifth Earl of Ross, the last of the first house; and that the Balnagowan family, therefore, had no claims at that early time. he quotes 'an ancient historian of Highland families' to prove the great power and possessions of Paul Mactyre, the passage, as cited, running thus: 'Paul Mactyre was a valiant man, and caused Caithness to pay him blackmail. It is reported that he got nyn score of cowes yearly out of Caithness for black-mail so long as he was able to travel'. "Now, there are a few words omitted in this citation. The original document, now before us, begins thus: 'Paul M'Tyre, aforesaid, grandchild to Leandris' that is, grandchild to Gilleanrias, the founder of the clan, and its name-giver. If he was the grandson of the founder of the sept, Paul Mactyre could certainly never have been the heir of the fifth Earl of Ross, unless he had lived to a most unconscionable age. It would seem as if Mr Skene here erred from the old cause - that is, from his not unnatural anxiety to enhance the value and authenticity of the MS of 1450, which was his own discovery, and certainly was a document of great interest. That MS speaks of Paul Mactyre as heading the clan at a comparatively late period. We greatly prefer the view of the case already given by us, which is, that Paul Mactyre was either kinsman or quasi tutor to one of the first Ross earls, or successfully usurped their place for a time. "Besides, the ancient document quoted by Mr Skene to show the greatness of Paul Mactyre, mentions also the marriage of 'his doughter and heire' to Walter, laird of Balnagowne. If the document be good for one thing, it must be held good also for others. Such a marriage seems quite natural, supposing Mactyre to have been a near kinsman of the Rosses. "Perhaps too much has been already said on this subject to please general readers; but one of our main objectives is to give to clansmen all the rational information procurable on their several family histories". "Among another class of Rosses or Roses", says the same authority, "noticed by Nisbet as bearing distinct arms, the principal family appears to be that of Rose of Kilravock", to which a number of landed houses trace their origin. According to a tradition at one period prevalent among the clan Donald, the first of the Kilravock family came from Ireland, with one of the Macdonalds, Lords of the Isles. There does not seem, however, to be any foundation for this, except, perhaps, that as vassals of the Earls of Ross, the clan Rose were connected for about half a century with the lordship of the Isles. Mr Hugh Rose, the genealogist of the Kiravock family, is of opinion that they were originally from England, and from their having three water bougets in their coat armour, like the English family of Roos, it has been conjectured that they were of the same stock. But these figures were carried by other families than those of the name Rose or Roos. Four water bougets with a cross in the middle were the arms of the Counts D'Eu in Normandy, and of the ancient Earls of Essex in England of the surname of Bourchier. They were indicative of an ancestor of the respective families who bore them having been engaged in the crusades, and forced, in the deserts of Palestine, to fight for and carry water in the leather vessels called bougets, budgets, or buckets, which were usually slung across the horse or camel's back. The badge of the Roses is Wild Rosemary. The family of Rose of Kilravock appear to have been settled in the county of Nairn since the reign of David I.
BADGE: Craobh Aiteann (Juniperis communis) juniper. PIBROCH: Spaidseareachd lana Ros, composed in 1427. THERE seems to be little doubt that the Chiefs of Clan Ross took their name from the character of the district in which they held their possessions. Ross is the descriptive name for a certain type of promontory, and the district of Ross in the north of Scotland is par excellence the great promontory of the country. It is in somewhat similar fashion that the Ord of Caithness and the Mull of Kintyre have come to be known above all others as "the Ord" and "the Mull" respectively. There seems to be no record of the time or circumstances in which the chiefs of the clan now bearing that name originally settled in the district. They may, therefor, have been originally of Celtic blood, or they may, like so many others of the Highland chiefs, have been settlers introduced from the south in the time of Malcolm Canmore and his son. In this latter case they would originally be known under the appellation of De Ros, from the name of their territory, and the appellation would, in the course of time, as in other cases, come to be their family name. The race was also known in the Highlands as the Clan Gille Andras, or Tribe of the Follower of St. Andrew, the tradition being that one of the early chiefs had been devoted to the service of the Patron Saint of Scotland. The chief of the clan does not appear in history till the reign of Malcolm IV., but when he does so, he is termed by Wyntoun the chronicler, one of the seven "Mayster men" or magnates of Scotland, and so must already have occupied a position of high power and consequence. According to the Register of Dunfermline, a certain Malcolm was at that time Earl of Ross, and he was probably the same individual with the Gille Anrias Ergemauche whom Wyntoun describes as chief spokesman, along with Ferquhard, Earl of Strathearn, among the seven magnates who conspired to overthrow the King, and place his brother William on the throne. The cause of the conspiracy was the fact that King Malcolm, as holder of an English fief, the Earldom of Huntingdon, had followed Henry II. of England in his expedition against Toulouse. Malcolm was holding his court at Perth in 1160, soon after his return from France, when the conspirators suddenly surrounded the city. The young King, however, proved more vigorous than they expected. Instead of waiting to be attacked, he took the offensive, drove them from the field, and pursued them into Galloway. There, at the third attempt, he overthrew his enemies. Fergus, lord of Galloway, became a monk at Holyrood and the Earl of Ross appears to have been forfeited. Two years later, at any rate, according to Documents, etc., illustrating the History of Scotland, IV. 5, p. 20, the earldom of Ross was granted as part of the dowry of the Princess Ada on her marriage with Florence, Count of Holland. It would appear, however, as if the earldom of Gilleanrias had before long been regranted to the son of that personage, for, shortly after the accession of Alexander II. in 1214, Ferquhard Mac-in-Sagart (son of the priest), Earl of Ross, appears performing a brilliant part in the history of the north. Donald Bane, representative of the legitimate line of "the gracious Duncan," appeared in that region to assert for the last time the claim of his house to the Scottish throne. He was promptly met there by the Earl of Ross, who defeated the rebels, slew the leaders, and, on presenting their heads to the king, received the honour of knighthood from the royal hand. The story is told in the Chronicle of Melrose. From that time the Earls of Ross appear as strong supporters of the Scottish King, and, holding Skye and the Nordreys, or northern islands, in opposition to a Norwegian nominee, seem to have done their best to complete the overthrow of the Norse power in the Isles. The "race of the priest," otherwise Gilleanrias, appear indeed to have been among the great leaders of that time who, under Alexander II. and Alexander III., finally defeated and overthrew the Norse dominion which had been closing its hold upon the north and west of Scotland for 500 years. Twenty years after the attempt of Donald Bane, the Earl of Ross did the King most substantial service in another province of his realm. On the death of Alan Fitz Roland, Lord of Galloway, that province seemed upon the point of being divided between his three daughters, Helen, wife of Roger de Quinci, Earl of Winchester, Christina, wife of William de Fortibus, and Devorgilla, wife of John Baliol. Resisting this partition, the people of the Province invited Thomas, a natural son of their late lord, to assert his claim, and proceeded to attack the neighbouring country with fire and sword. King Alexander advanced into Galloway with an army, and while his forces were entangled in marshy ground, ill suited to the movements of mounted men-at-arms, the insurgents rushed down from a hill, and would have overwhelmed him, had it not been that the Earl of Ross, at the head of his own light-armed mountaineers, came up in time, attacked the Galloway men in the rear, and scattered them in disorder. Alexander, it will be seen, had good reason for his policy of confirming and supporting the Earl of Ross in his great possessions in the north, as a buttress against the power of the enemies of the throne. The fortunes of the family of Ross thus rose upon the decay of the ancient Norwegian earldoms of Orkney and Caithness. By the middle of the century Alastair, Earl of Ross, had attained the high position of Justiciar of the Kingdom, and from that time, for two centuries and a half, the Earls of Ross remained the most powerful nobles in the north. In the boyhood of Alexander III., when his father-in-law, Henry III. of England, was scheming to secure a suzerainty over Scotland, and actually effected a coup de �tat at Roxburgh, the heads of the Scottish Government, whom he succeeded in displacing, were the great Walter Comyn, Earl of Monteith, John Baliol, father of the future king, and Robert de Ross, these personages being too patriotic for the purposes of the English monarch. The Robert de Ross who thus appears in a heroic light on the historic page may have been a brother or a son of the great northern Earl. In the campaigns of Robert the Bruce and his brother Edward, Sir Walter, the Earl of Ross of that time, appears as the bosom friend of the latter, and he and Sir William Vipont are recorded as the only persons of note who were slain on the side of the Scots at the battle of Bannockburn. At the battle of Halidon Hill, again, after the death of Bruce, one of the four divisions of the Scottish army was led by Hugh, Earl of Ross. When the day was going badly against the Scots, who, as they struggled through the marshy ground, were falling thick as leaves in Vallombrosa under the arrows of the English bowmen, the Earl proceeded to lead his division against the wing where Edward Baliol commanded, but was driven back and slain. Thirteen years later still, when David II. was gathering a great Scottish army in preparation for the ill-fated campaign which was to end in defeat at the battle of Durham, the Earl of Ross took part in a transaction which withdrew a large part of the Scottish forces from the royal army. The muster took place at Perth, and was the greatest known for a considerable period. Unfortunately, however, it afforded an opportunity for ancient feuds to break out between the Highland chiefs. Among these the bitterest occurred between the Earl of Ross and Ranald of the Isles. This came to a head in the monastery of Elcho, where the Earl assassinated his enemy. Forthwith, dreading the royal vengeance, the Earl withdrew his men, and retreated rapidly into the north. At the same time the Islesmen, having lost their leader, dispersed in confusion. Not only did the king find his forces considerably reduced in consequence, but the event made a serious impression upon the spirits of the army, by whom it was looked upon as an omen of disaster. This Earl, William, left no male issue. His daughter, Euphemia, married Sir Walter Leslie of Leslie, Aberdeen-shire, and he, in her right, assumed the title of Earl of Ross. Their son, again, was known as Alexander Leslie, Earl of Ross. Alexander married a daughter of the Regent Duke of Albany and upon his death, about the year 1405, his only child, a daughter, having become a nun, was induced by the all-powerful Duke of Albany to assign the lands and earldom to her mother�s brother, the Earl of Buchan. Alexander Leslie�s sister, Margaret, however, had married Donald, Lord of the Isles, and he, in her right, now claimed the earldom of Ross. Raising an army of 10,000 men, he took possession of the Earldom, and, marching southwards, reached Inverurie on the Don, less than twenty miles from Aberdeen. There he was met by the Regent�s forces under the Earl of Mar, and on St. John�s Eve, 24th July, fought the bloody battle of Harlaw. Ultimately, by a treaty with Albany at Lochgilp on the Firth of Clyde, Donald was forced to relinquish the earldom; but, after the return of James I. and the overthrow of the house of Albany, Donald�s son, Alexander, who was the King�s cousin once removed, was recognised as Earl of Ross. In this way the earldom of Ross became separated from the chiefship of the clan, and it ultimately, after the forfeiture of John, Lord of the Isles and Earl of Ross, at the end of the fifteenth century, was conferred upon the second son of James III. and a succession of other holders. Meanwhile, however, the chiefship had really passed to a brother of the last Earl William, father of the Countess Euphemia. This brother, Hugh Ross of Rarichies, in 1374 received a charter of the lands of Balnagown. The influence of the Leslies, who as feudal superiors in right of the Countess Euphemia, claimed the services of the Ross-shire tenants as their vassals, prevented Balnagown from openly exercising the powers of the chiefship, and a near relative, Paul MacTyre, a man celebrated for his valour, took command of the clan, much in the same way as at a later day the famous Rob Roy took command of the MacGregors. When at last the Balnagown family was able to resume its proper authority, the power of the clan had considerably declined, and in the feuds which followed it suffered still further loss. The chief of these feuds was with the Mackays of Strathnaver. Again and again the Rosses had suffered molestation from these enemies, and when at last, driven to desperation and thoroughly infuriated, they gathered their forces and marched against the Mackay Chief, they were in the mood to teach a severe lesson. The Mackays, with Angus of Strathnaver at their head, finding themselves fiercely attacked, sought shelter in the church of Tarbat. There several were slain, and, the church being set on fire, Angus Mackay and many of his clansmen were burnt to ashes. To avenge this "cruel slaughter," Ian Riach MacKay gathered his men, and, helped by a force of the Sutherlands, his neighbours on the south, invaded the territory of the Rosses and proceeded to lay it waste with the utmost fury. In defence of his people, Alastair Ross, the Laird of Balnagown, gathered all his forces, and, meeting the invaders, engaged in the long and desperate battle of Blair alt na charish. In the end the battle went against the Rosses, Alastair himself being slain, with seventeen gentlemen of his clan and a great number of others. The defeat proved a real disaster, from which the clan never really recovered. In 1427 the Earl of Ross could bring into the field 2,000 men; in 1715 the strength of the clan was reckoned at no more than 360, and by 1745 it had only increased to 500. At the beginning of the eighteenth century the line of Balnagown came to an end. David Ross, the Chief, finding himself the last of his line, sold the estate to General Charles Ross, brother of Lord Ross of Hawkhead near Glasgow, in whose family it has since descended. The Hawkhead family, however, were in no way related to the Rosses of the North, their ancestor having come from Yorkshire in the twelfth century, and settled in the county of Renfrew. As a matter of fact the Rosses of Balnagown of the present day are descended from the Rosses of Hawkhead only in the female line, the estate having been inherited by Sir James Lockhart, Bart., of Carstairs, on the death of his cousin, William, fourteenth and last Lord Ross, and the name Ross having been assumed by the Lockharts in consequence. Thus, though of an ancient race, the present house of Balnagown can make no claim to the chiefship of the clan. On the death of David Ross of Balnagown in the eighteenth century, the chiefship passed to Ross of Pitcalnie, who thus became representative of the ancient and powerful race of northern Earls. Sept of Clan Ross: Anderson, Andrew, Dingwall, Gillanders, MacAndrew, MacCulloch, MacLulich, MacTaggart, MacTear, MacTier, MacTire, Taggart, Vass, Wass. The clan Ross derives its name from the old Celtic earldom of Ross and they are believed to be descended from Gilleon na h-airde, ancestor of Anrias, whose descendant Fearcher Mac-an-t-Sagairt, "Son of the Priest" helped crush a rebellion for the crown in 1215. For his services he was knighted and recognized as the Earl of Ross in 1234. This title in turn gave its possessors great authority and power in the North of Scotland. His grandson William fought at the Battle of Bannockburn and Hugh, the 5th Earl was killed at the Battle of Halidon Hill in 1333. Hugh's successor, William died without male issue and succession passed through the female line which later led to a struggle for the Earldom between the Lords of the Isles and the Regent Albany. The chiefship devolved upon William Ross, 2nd of Balnagowan and for over three centuries this line remained the principal family of the clan. From the 15th to the 16th century, the Rosses were preoccupied with a feud against the Mackays of Strathnaver culminating in the Battle of Blar Ault an Charish on the River Carran in July 1486, when Alexander 6th of Balnagowan and 17 of his clan were killed. David Ross, 12th of Balnagowan fought for Charles I at Worcester and died a prisoner in London in 1653. His son David supported William and Mary and was the last of the direct line. On his death in 1711, the estate was settled on the Renfrewshire family of Ross of Hawkhead, who were of no blood relation. The Munro Rosses of Pitcalnie became the senior representatives of the old line. During the Jacobite rebellions the Rosses supported the government, but later, during the 19th century the Rosses suffered heavily through the clearances particularly in Strathcarran in 1854. The Rosses are distinguished by having possibly the most important American connections of any Scots clan and took prominent roles in key episodes of American history. Many other Rosses have also achieved distinction in Canada and in Prussia, where the Counts von Ross were famous soldiers.